The word “Shunya” means empty and the practice of Shunya mudra is useful to decrease space element in the body.It is also called as Aakash Shaamak mudra. Shunya mudra is very easy to do, just placing the tip of the middle finger at the bottom of the thumb and apply a little pressure. The middle finger represents space element in the body by practicing this mudra you can decrease space(Aakash) element in the body. Shunya mudra is used in Ayurveda treatments of disorders (enlisted below) caused by an abnormal increase of space within the body. The element space is associated with ears. Therefore, Aakash-Shaamak mudra helps to heal certain ear disorders. In fact, it is an almost fail-proof remedy for ear pain. The decreased internal space restricts the other four bodily elements, i.e., Vayu(air), Agni(fire), Jal(water) and Prithvi(Earth). 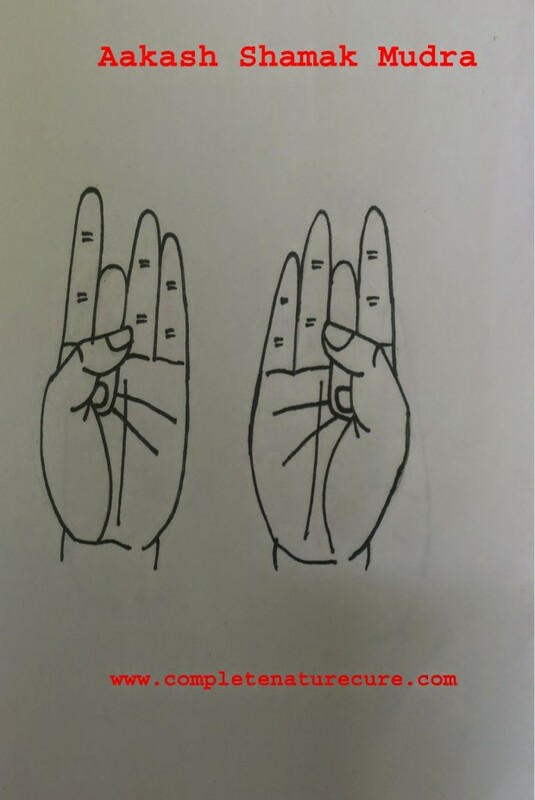 Therefore, Aakash-Shaamak mudra can be beneficially combined with Vayu mudra, Prithvi mudra, Surya mudra and Jalshammak mudras. Space(Aakash) is the primary component of Vata Prakriti.The practice of Shunya mudra is useful to treat Vata Dosha. Shunya mudra has various health benefits.This mudra is very much helpful in treating following conditions. Ear ailments like pain, tinnitus(noises), vertigo and acquired deafness. This mudra is used in Ayurveda treatments of all the diseases caused by an excess of Vata. The practice of Aakash-Shamak mudra is useful to balance for the people who have tri-dosha. Thirty to forty-five minutes of regular practice is enough to get the desired results. This Mudra can be performed at any time or in any position. 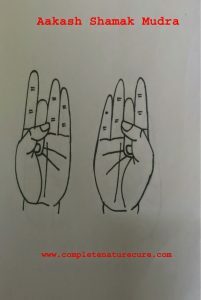 It is preferable that early morning hours and when you are meditating practice this mudra to get quick results. There are no major side effects in the practice of Aakash-Shamak mudra. But if you are a Vata deficient person then do this mudra moderately. After getting the desired result you should stop the practice of Shunya mudra.